"University of Miami has had 23 All-American football players since 1950. One of those 23 is Dan Conners, an ever brilliant lineman, who tonight is being inducted into the UM Sports Hall of Fame. Conners was an outstanding tackle on two University of Miami football teams which went to bowl games--but his finest year was in 1963 as a senior when his glowing play that season brought him his coveted All-American acclaim. Dan came to the University of Miami from St. Marys, PA., where three times he starred and lettered in football and wrestling. He also played baseball, garnering one letter in that sport. Big, aggressive and fast, Dan was the center on his freshman team at the University of Miami after playing fullback and center during his spectacular high school days. In his first spring practice with the Hurricanes, coaches figured he was too good to be playing behind a pair of veteran centers and gave him a chance at one of the tackle positions. Dan took to that position as though it was made for him, and after getting increasingly more important alternate assignments as a sophomore, he displaced the man ahead of him in his junior year and owned the job from then on. He was husky, he was fast and alert. It was almost impossible to block him out of a play--and conversely, it was just as hard to get past him to any Miami ball carrier he was protecting. During his stellar career at Miami, Dan has 207 slashing tackles. Conners was a 6-2, 222 pounder at the start, but got close to 240 pounds in his bruising senior year. He broke the one-season defensive record for a tackle at that time with 57 tackles and 38 assists in 1962. 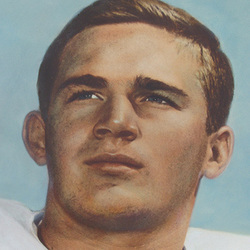 In 1961, Dan played in the Liberty Bowl in Philadelphia against Syracuse and the following season in the thrilling Gotham Bowl Classic against Nebraska in New York City. That year, Miami posted victories over such teams as Penn State, North Carolina, Georgia, Tulane, Northwestern, Florida, Pittsburgh, Maryland and Purdue. Conners went on to the pro ranks and was a long-time star for the powerful Oakland Raiders teams. He was an outstanding middle linebacker during his great career with the pros."